Chedi View Hostel & Rooftop Bar i Phetchaburi, Thailand: Reservér nu! Well-located in the culture, sightseeing area of Phetchaburi city, Chedi View Hostel & Rooftop Bar provides a most conducive spot for you to take a break from your busy days. The hostel surrounded by local and many temples. We provides accessibility to important town facilities such as local food court, 24 hrs convenience store and night market . We are located 10 mins walk away from van station, 20 mins walk from train station. We offer 6 private rooms and 2 of 4-bed dormitory rooms. All the rooms are spacious with air-conditioned and comfy mattress . 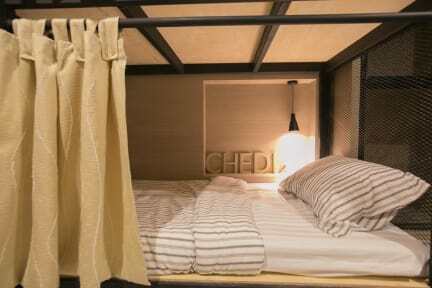 All bed in dormitory come with curtain, a private reading light and a huge locker.